Tony Menendez, CFE, found some questionable accounting practices at Halliburton. 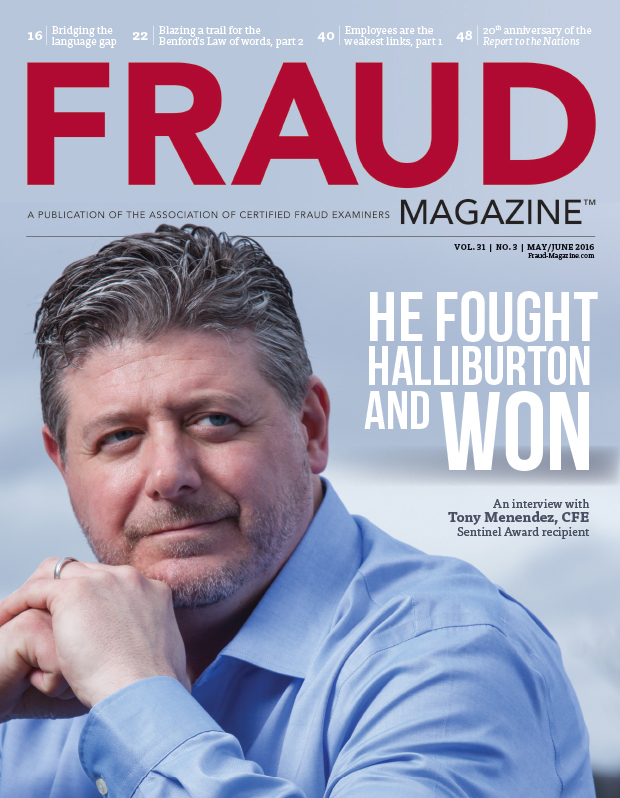 When he realized the company was knowingly violating SEC rules — and the SEC wasn’t going to investigate — he brought a whistleblower claim against Halliburton for violating his rights under the Sarbanes-Oxley Act. When fraud examinations cross borders and cultures, interpreting services are crucial. Here you’ll learn what to do before, during and after an interaction with a foreign-language speaker and how to effectively communicate through the use of an interpreter. The author applies his unique letter analytic techniques to a variety of examples, including keyword searches and predictive analysis using benchmark data. The aim? Finding fraud in the words.